Living organisms are accustomed to periods of night and day alternating at set intervals. Most of the human body’s regulating hormones follow this cycle, known as circadian rhythm. The word circadian comes from the Latin, circa, meaning about, and dies, meaning day. These cycles are not exactly 24 hours long, hence the “circa.” Each chemical has its own cycle of highs and lows, interacting with and influencing the other cycles. Body temperature, sleepiness, thyroid function, growth hormone, metabolic processes, adrenal hormones, and the sleep hormone melatonin all cycle with daylight. There is a direct connection between the retina (the light-sensitive structure at the back of the eye) and the part of the brain that controls all these hormones. Artificial light has some effect but sunlight has much more. Disruption of circadian rhythms affects the sleep-wake cycles of night-shift workers as well as travelers. When people are without clocks in a compartment that is completely closed to sunlight, most of them fall into a circadian cycle of about 25 hours. Normally, all the regulating chemicals follow one another in order like threads in a weaving pattern. Every morning the sunlight resets the cycle, stimulating the leading chemicals and thus compensating for the difference between the 24-hour day and the 25-hour innate rhythm. When traveling through a number of time zones, most people reset their rhythms within a few days, demonstrating the adaptability of the human species. Some people, however, have upset circadian rhythms that last indefinitely. Traveling through a few time zones at a time is not as disruptive to circadian rhythms as traveling around the world can be. The foremost symptom of jet lag is altered sleep pattern—sleepiness during the day, and insomnia during the night. Jet lag may also include indigestion and trouble concentrating. 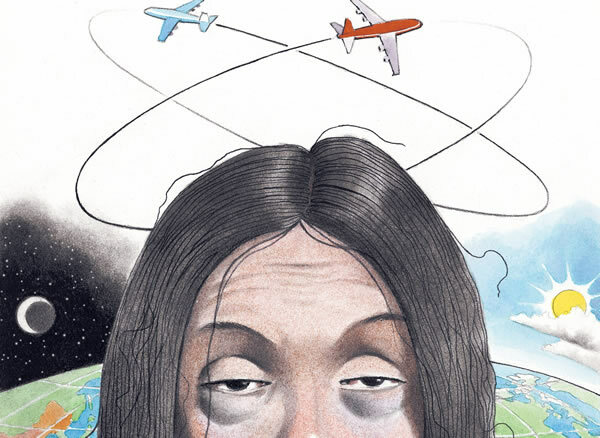 Individuals afflicted by jet lag will alternate in and out of a normal day-night cycle. Exposure to bright morning sunlight cures jet lag after a few days in most people. A few will have prolonged sleep phase difficulties. For these, there is a curious treatment that has achieved success. By forcing one’s self into a 27 hour day, complete with the appropriate stimulation from bright light, all the errant chemical cycles will be able to catch up during one week. When selecting an international flight, individuals should try to arrange an early evening arrival in their destination city. When an individual is traveling to a destination in the east, he or she can try going to bed and waking up a few hours earlier several days before their flight. If travel is to the west, going to bed and waking up later than usual can help the body start to adjust to the upcoming time change. More specific recommendations are available as of 2002, tailored to whether the person is traveling through six time zones, 7–9 zones, or 10 or more. Once arriving in their destination city, individuals should spend as much time outdoors in the sunlight as possible during the day to reset their internal clock and lessen the symptoms of jet lag. 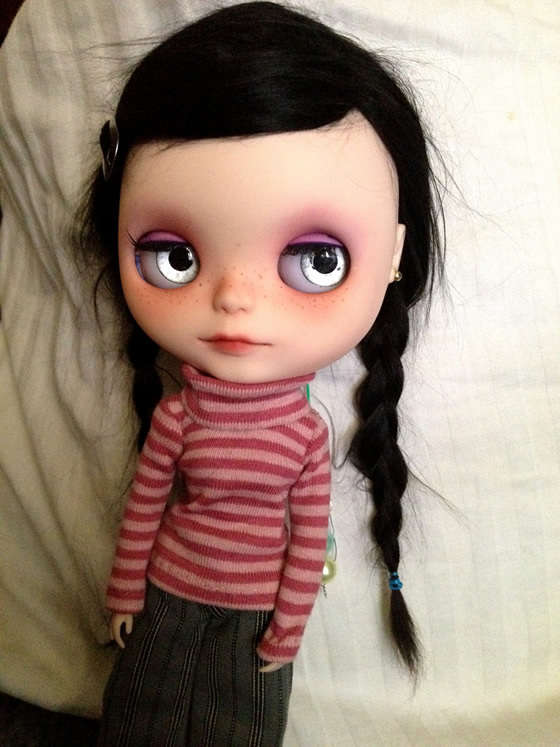 Bedtime should be postponed until at least 10 P.M., with no daytime naps. If a daytime nap is absolutely necessary, it should be limited to no more than two hours. To promote a restful sleeping environment in a hotel setting, travelers should request that the hotel desk hold all phone calls. Because sleeping in too late can also prolong jet lag, an early wake up call should be requested if an alarm clock is not available. If the hotel room is noisy, a portable white noise machine can help to block outside traffic and hallway noises. A room air conditioner or fan can serve the same purpose. The temperature in the room should also be adjusted for sleeping comfort. New information shows that exercise when at the destination can also help. When headed westbound, travelers should exercise for one hour in the evening. If going eastbound, they do best by exercising in the morning. All antioxidants help to decrease the effects of jet lag. Extra doses of vitamins A, C, and E, as well as zinc and selenium, two days before and two days after a flight help to alleviate jet lag. Melatonin, a hormone that helps to regulate circadian rhythms, can also help to combat jet lag. Melatonin is available as an over-the-counter supplement in most health food stores and pharmacies. Reports in 2002 show that the drug is safe for short-term use and recommend 5 mg between 10 pm and midnight at the destination to help fall asleep and to sleep better. If weather prevents an individual from spending time in the sunlight, light therapy may be beneficial in decreasing jet lag symptoms. Light therapy, or phototherapy, uses a device called a light box, which contains a set of fluorescent or incandescent lights in front of a reflector. Typically, the patient sits for 30 minutes next to a 10,000-lux box (which is about 50 times as bright as an ordinary indoor light). Light therapy is safe for most people, but those with eye diseases should consult a healthcare professional before undergoing the treatment. In 2002, a team from Flanders University invented new jet lag sunglasses equipped with a vision device that used light to stimulate travelers’ brains. They believed that wearing the glasses before and during flights could help the internal human clock adjust more easily to changing time zones. The researchers were looking for a commercial partner to help them further study the glasses and make them widely available. The effectiveness of glasses or other head-mounted light devices is still uncertain, however. A team of researchers at Columbia University reported in the fall of 2002 that the use of a head-mounted light visor yielded only modest improvement in the test subjects’ symptoms of jet lag. In cases of short-term insomnia triggered by jet lag, a physician may recommend sleeping pills or prescription medication. Such medication should be taken only under the guidance of a health care professional. 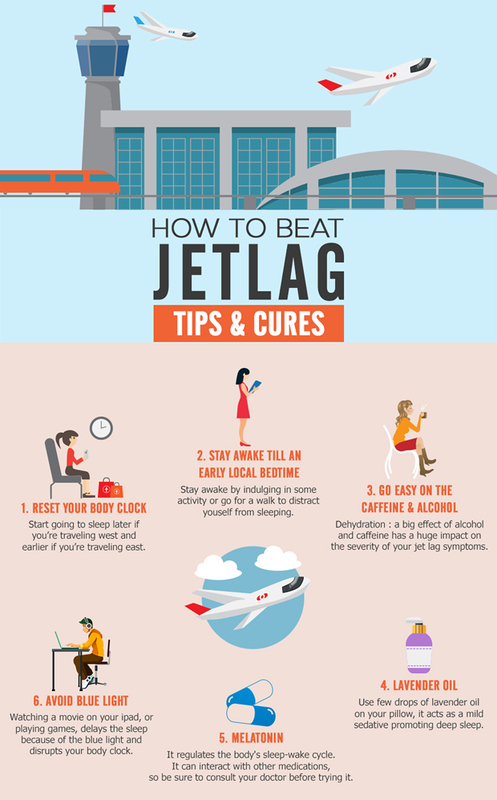 Jet lag usually lasts 24–48 hours after travel has taken place. In that short time period, the body adjusts to the time change, and with enough rest and daytime exposure to sunlight, it returns to normal circadian rhythm. Eating a high-protein diet that is low in calories before intended travel may help reduce the effects of jet lag.